The following are some of the positive things that our customers had to say about us. Our goal is to provide sincere and helpful customer service, and provide industry leading products. It makes us happy to hear that we are accomplishing those goals. Your representative was excellent. Sent me literature and quotes on the equipment I needed, making it much easier for my father in law to see exactly what he would be getting and what it would cost. Excellent communications. From the preordering to the delivery. This is the best customer service I have encountered for a long time. I would highly recommend Accessibility Professionals to anyone in the market for accessibility equipment. I will be installing a roll in shower in the near future. No question where I will be purchasing from. We received our lift yesterday, and all was good. It was a pleasure doing business with you and your company. Very smooth transaction and purchase. My lift arrived safe and sound. I would like to thank you and the company for the excellant and fast service that I received. You have restored my faith in online shopping thanks again. We received the lift last Thursday and installed it on Saturday. It is working great and my parents now can come and go on their own. Thanks to you and Accessibility Professional's Team for your prompt service! 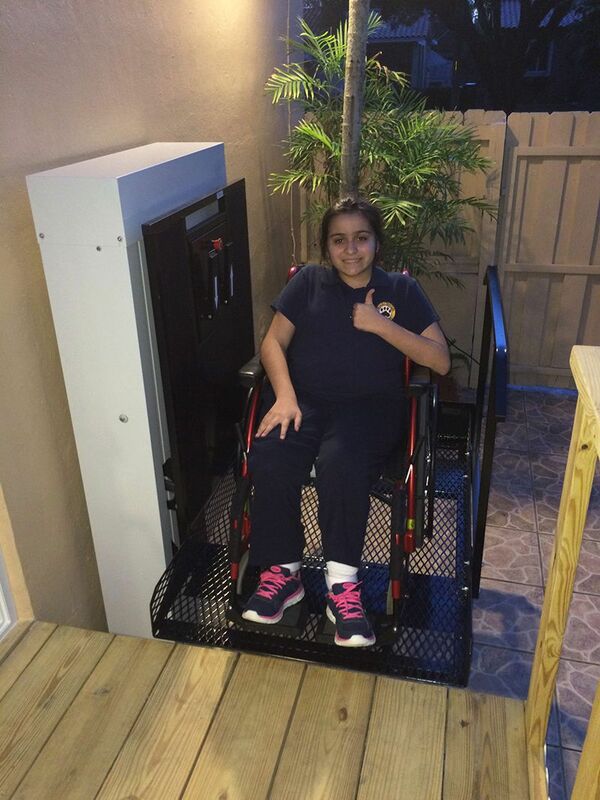 From the first moment I contacted Accessibility Professional, Inc. to purchase a wheelchair lift right through this survey request, I have nothing but praise for the way my initial product inquiry and the order process was handled. Truly, as the name implies, this company is "professional". It was very easy to put together. It's built well. Everything was perfect...It worked out very well. Received lift on 8/21 and installed it on 8/23 works GREAT ! Thanks for all your help it is wonderful to work with a company that does what they say with no "hidden" charges showing up later !! You were very professional and prompt with all information. "If you're gonna purchase a lift, this is the one you need to buy." Jeff was very pleased with his Freedom Lift System. See his complete testimonial video here. We got the lift home on the Friday, unpacked it on the Saturday, then we started to assemble it at 8am on Sunday and by 4pm that day, it was operational. Everything went smoothly and my wife is tickled with it. We both have walkers, so we are very satisfied with it. Thank you to everyone. The lift is wonderful. My mom feels so independent because she can push the up and down buttons herself. It was easily installed and we love it. I am 86 years old and no longer able to negotiate the steps into my home and was seriously considering having a rather long ramp built in order to maintain access and mobility. I approached a local building contractor about the possibility. He suggested looking into getting and installing an electric lift rather than destroying the esthetics of our 125 year old home by adding an extremely long ramp to the outside of the building. After considerable research on his part, and on mine, we agreed that your Trust-T-Lift would be the best answer for my situation. It turns out he was right about the decision to go with a lift and the choice of your product. After preparing the platform and base for the lift, the machine itself became the simplest part of the installation. 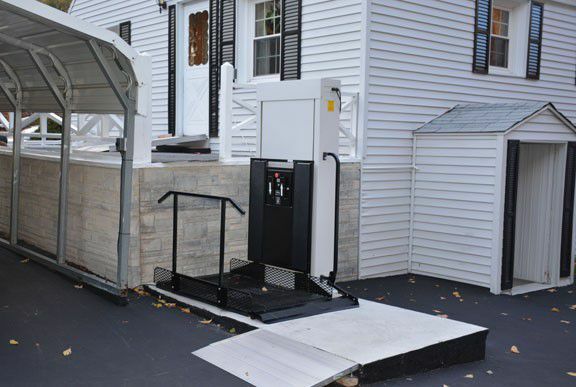 The contractor, Greg Robinson, (Robinson Constructions of Roscoe, New York), found the installation so simple and direct that he feels confident to recommend it to any disabled individuals who may approach him in the future. I, too, am so pleased that l wanted to take this time to let you know I think you have a wonderful product. Your firm not only provides the highest quality of assistance prior to the sale, but even subsequent to the sale. I was missing small part that had jiggled loose during the shipping process, and instead of hanving me deal with the manufacturer, your representative (Cindy) took care of everything with timely updates every step of the way. The chair lift came in on the 19th of January. Our son installed in a couple of hours by himself. Works wonderful now my husband can get in and out of the house safely. The lift arrived without one piece of the shrink wrap snagged. A great job in packaging. We salvaged the 2x4 and built some shelves in the garage. 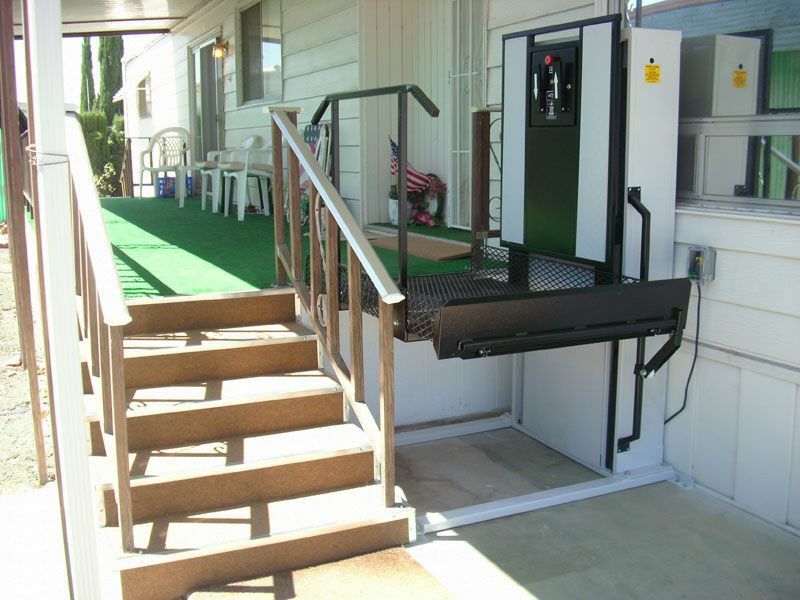 Hi I received the wheelchair lift at about 11:30 on Thursday. It was well packed. I was completely done installing the lift by 1:30 that same day. Very easy to follow instructions. We used it today for my father-in-law. My wife and her father and I are very happy with the lift and how easy it was to install and use. Thank you. Your company and this lift has made our lives much simpler. Thank you. Staff were very informative. Lift arrived even sooner than expected. Works great. Patty (ALS) is able to get out of the house independently for the first time in 1.5 years. Sor far so good. We had contractor for our remodel install it...I "sing your praises" to everyone in our group. In our small yard, a ramp woudl have consumed 1/2 of it. The lift makes us all happy! Thank you for the lift it works excellent. Here’s a photo of my daughter using it, it’s easier than going up a ramp for her. Thank you. 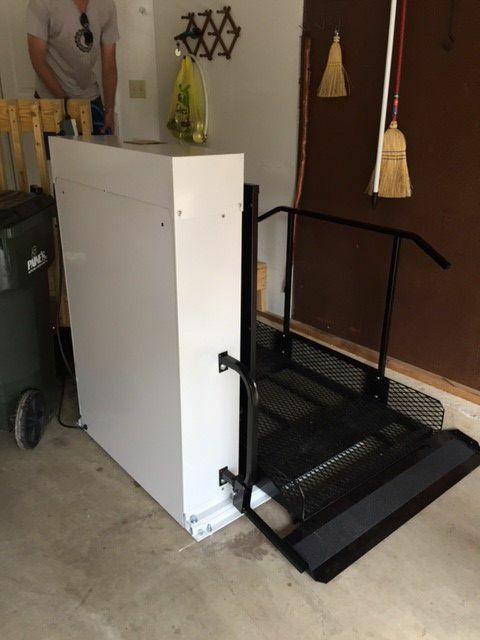 The Freedom wheelchair lift has been a life saver for my dad. He can now get out of the house everyday in his wheelchair. We used to have to leave an extra 45 minutes early in order to get my father out of the house to get to his doctors appointment. The lift was affordable. My son and I installed it in less than a day. 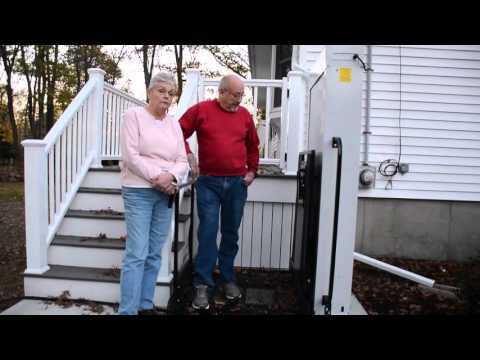 We received our porch lift on one skid. Was pack wrapped very good. The plan for removing and installing in our garage went very well. We took our time and each step went well. Everything went well. It runs very quiet and smooth. Thank you for having a great product. All you folks was so kind and polite on the phone and emails. I would not change a thing. You all do a good job, keep it just the way you have it. I have a safe way to come and now, my 51inch travel goes very good. We are very happy with the lift you manufactured for us. We installed it in its own small building, in order to protect it from the weather so it will last for many years. 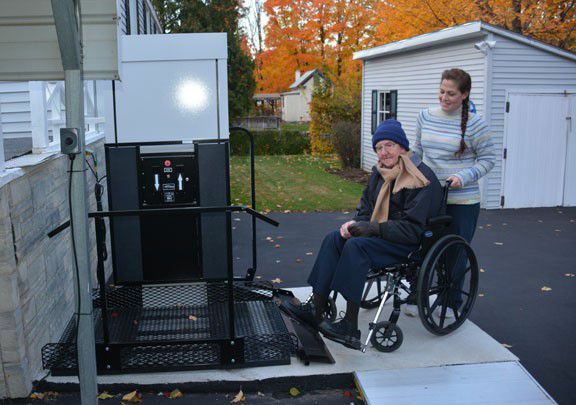 The lift was necessary so my wife can access our property in her electric wheelchair and it has made her life better. So thank you. The Nashs' are thrilled at the changes made. Not only the convenience/opportunity to exit their home to accommodate medical appointments but additionally they now have the freedom to visit their gardens, which is healthfully as important. 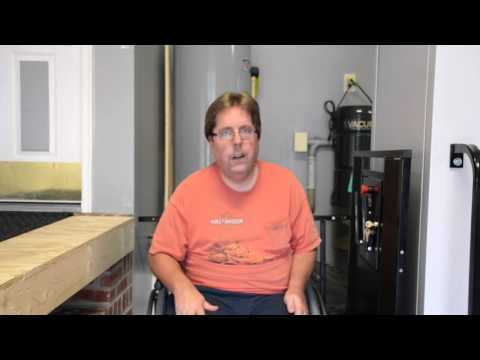 I have been asked to talk about Accessibility's wheel chair lifts. I have installed a number of these lifts and are very satisfied with them. They are packed very well and very easy to assemble. When the order is placed it is very simple and to verify the unit you are ordering because of the picture they send shows Right , Left or straight through. In short I would recommend these units. All of my customers have been happy with the units also.